Deaths linked to alcohol are significantly more common than drug overdose deaths, but lawmakers may promote more drinking through a two-year tax break for producers of beer, wine and spirits as part of the Senate’s tax code overhaul. The tax break, for 2018 and 2019, would save alcohol producers $4.2 billion, according to the Joint Committee on Taxation. The provisions in the Senate Finance Committee’s tax plan were requested by Republican Sen. Rob Portman of Ohio, but are based on a bill from Sen. Ron Wyden of Oregon, the committee’s top Democrat. Supporters of the tax break emphasize its benefits for small brewers, whom they tout as job creators. But public health experts who study the link between taxes and alcohol consumption think the economic impacts are overstated, especially since the underlying idea is for people to buy more alcohol. Portman touted the job growth potential during the Finance markup last week. Watch: House GOP Giddy After Tax Bill Win — But Will Senate Kill the Mood? But all alcohol producers — including giant brewers, wineries and distilleries — would benefit from the changes. The Beer Institute, which lobbies on behalf of all brewers, estimates that it would save the beer industry $130 million a year. Large brewers like Anheuser-Busch InBev, the global conglomerate that makes Budweiser and produces more than 100 million barrels of beer in the United States, would get a modest tax break, around $12 million. Smaller brewers would get a steeper cut for the first 60,000 barrels they produce. A brewery that makes 10,000 barrels a year would save about $35,000 annually. The Brewers Association, which represents the smaller producers, thinks that these relatively minuscule amounts would go a long way for their members. The Brewers Association has not taken a formal position on the broad tax overhaul despite its support for the alcohol-related provisions. But public health experts cited potential harm from greater alcohol use and cast doubt on the economic effects. “If the purpose of the bill is to generate more jobs, more economic activity, the only way that’s going to happen is if they generate more business,” said David H. Jernigan, a professor at the Johns Hopkins Bloomberg School of Public Health. 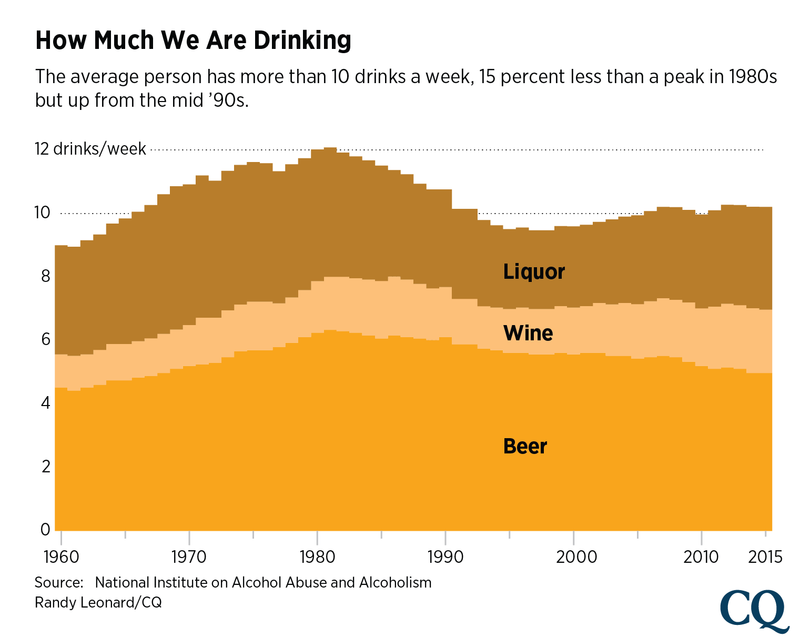 The tax changes would come as per capita alcohol consumption is climbing after dramatic decreases in the 1990s, which followed record consumption rates in the preceding decades. On average, every American age 14 and over consumed the equivalent of 2.32 gallons of ethanol in 2015. That’s 258 beers, 104 glasses of wine and 168 shots per person in a year. That is down slightly from its recent peak in 2012, when it was the equivalent of 2.34 gallons of ethanol per person. That compares to the equivalent of 2.25 gallons in 2005 and 2.14 gallons in 1997. Increased consumption of wine and spirits are fueling the rise, while beer consumption has dropped slightly. Excessive drinking is concentrated among a relatively small number of drinkers, since only 56 percent of the population reported having a drink in the past month in 2015, according to the National Institute on Alcohol Abuse and Alcoholism. On the other hand, 26.9 percent of adults reported binge drinking — 4 or 5 drinks within two hours — and 7 percent reported “heavy” use, defined as binge drinking five or more days in the past month. The most recent data from the Centers for Disease Control and Prevention on alcohol-related deaths come from 2006 to 2010, when each year on average there were 88,000 deaths from alcohol poisoning, traffic accidents or consumption-related chronic conditions. By comparison, drug overdose deaths are likely to be around 65,000 for 2016. The CDC estimates that in 2010, excessive drinking resulted in economic losses of $249 billion from lost workplace productivity and health care expenses. There has not been extensive research into how a tax cut could impact consumption. But Philip J. Cook, a Duke University professor of public policy, has examined the result of the original 1991 excise tax that the industry is now seeking to reduce. In a 2012 study, Cook and a colleague argued that the 1991 tax saved more than 6,000 lives in the first year it was imposed. Another 2012 study found that a hypothetical tax increase would mostly have the greatest economic effect on the heaviest drinkers, and would result in an 11.4 percent reduction in heavy drinking and a 9.2 percent reduction in drinking overall. Interest groups representing the wine and spirits industries did not respond to multiple requests for comment. But the two beer industry lobbying groups pushed back against the idea that it would result in more consumption. “Because the tax savings is limited for the larger players and spread among 5700+ smaller players, we don’t believe it will affect the price of beer or consumption,” Pease of the Brewers Association said in his email. Lawmakers behind the legislation don’t believe it would have negative health implications. “While alcohol misuse and addiction is always a health concern, Senator Wyden’s legislation focuses on revamping antiquated regulations that unfairly punish small craft beverage companies that are growing America’s economy,” said a spokeswoman for Wyden, who noted that he supports access to substance abuse treatment and fought to preserve protections under the 2010 health care law. Despite the inclusion of Wyden’s provision, he and most other Senate Democrats are likely to oppose the tax overhaul. Throughout the Finance markup, Democrats were insistent that the GOP tax plan would benefit the wealthy at the expense of middle-class taxpayers. While the industry and its supporters frame the tax cuts as a job-creation tool, researchers point out that the opposite may be true. A study by Jernigan and several colleagues, published in July in the journal Preventive Medicine, modeled the effect of new hypothetical excise taxes and sales taxes for alcoholic drinks. They found that while those taxes would result in job losses for the beverage manufacturers and related industries, they would result in net increases as consumers would choose to spend their money elsewhere and the government would have more tax revenue to spend. The public health arguments against an alcohol tax cut are unlikely to gain traction in Congress, where a majority of both chambers support cuts, especially to smaller craft beverage producers. Jody L. Sindelar, a professor of public health and economics at Yale University, said that it’s harder to make a case for alcohol taxes than for other harmful products like tobacco. She and others also noted the influence of alcohol lobbyists. Alcohol manufacturers and their trade associations have spent $22.5 million lobbying Congress so far in 2017, and last year spent $26.9 million. They spent $12.3 million supporting candidates for Congress of both parties in the 2016 election cycle, and have so far spent $3.9 million for 2018. Correction 1:21 p.m. | The headline of this article originally misstated the amount alcohol producers stand to save under a proposed tax break. It is $4.2 billion.